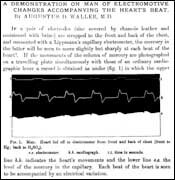 In the first of a regular series, BCS.com looks at the the equipment of Dr Augustus D Waller, who recorded the first human electrocardiogram. In May 1887 at St Mary's Hospital London Dr Augustus D Waller recorded the first human electrocardiogram using this apparatus. It consists of a photographic plate mounted on the chassis of a hand made toy train. The train moved slowly on its track, pulled by the brass gearing seen to the left. The cardiac potentials were obtained with a Lippman electrometer and a beam of light from its mercury column was projected on to the photographic plate which was protected by the wooden slide until the recording was made in a dark room. The original recording from the Journal of Physiology 1887;8:229. The upper trace is the apex beat and the electrocardiogram is depicted at the black and white interface. The ECG deflections point downwards and were labelled by Waller A, V1 and V2 (V1 and V2 added on the trace above by us) corresponding to our P R and T. Atrial activity is not present in this tracing. 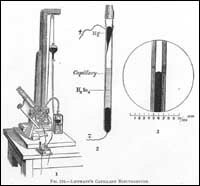 The capillary electrometer designed in 1875 by Gabriel Lippmann who also developed a photographic method of producing a permanent record of the changes in potential. This invention made it possible to study the animal electrocardiogram for the first time and remained in use for over 20 years until the string galvanometer was invented in 1901 by Willem Einthoven.